I was a bad American-Swedo. I skipped out on the Swedish Royal Wedding and Love Stockholm in favor of Germany. It wasn’t my idea, the Swede wanted a weekend away from the festivities. Instead, my friend Andrew attended the Kortege and snapped some spectacular photos. He also is a blogger and photographer at Ett Foto. Unfortunately, he was not invited to the delicious banquet dinner to eat Norwegian lobster, cod, chilled green pea soup, whitefish roe, char, poached quail egg, asparagus and beetroot from Gotland, veal sirloin from Stenhammar, strawberry mousse with rhubarb and vanilla ice cream in white chocolate. Mumms! Except the green pea soup. 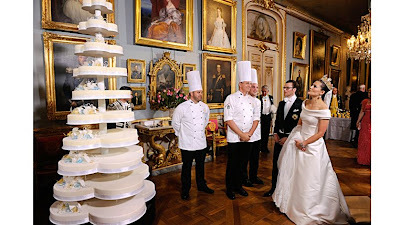 It’s beautiful to see Crown Princess Victoria’s wedding go through without a hitch. Her younger sister, Princess Madeleine, spent the past two months in scandal when her douchebag ex-fiance cheated on her; ending the engagement and canceling their royal wedding. The 250kg wedding cake made of strawberries, champagne mousse, pulled sugar, and soft almond meringue. The speech by Prince Daniel. It was really beautiful and lovely. Brings chivalry backs to Sweden and sets the bar high for all the Swedish men. The transcript to Prince Daniel’s speech. He did speak in both English and Swedish. För nio år sedan hade jag förmånen att lära känna en ung kvinna med en härlig humor, en stark pliktkänsla och dessutom väldigt, väldigt klok. Vi blev vänner. Ju mer jag lärde känna henne desto mer oemotståndlig blev hon. De här åren med dig Victoria har flugit förbi, har varit de bästa i mitt liv. There have been times when Victorias official duties have separated us. Often taken her to faraway countries and continents. I will never forget some years ago when she left for one of her many trips, this time to China. We were going to be apart for a whole month. The night before she left she got home late after an official engagement, and she had many preparations to make before the long month of duties ahead. Instead of getting some valuable sleep she stayed up the whole night writing. This romantic gesture is typical of you Victoria. It says everything about the loving person you are. Once upon a time the young man was… perhaps not a frog, in the beginning of the fairytale… as in the story first told by the Grimm brothers. But he was certainly not a prince. The first kiss did not change that. His transformation was not possible without the support of the wise king and queen, who had ruled the kingdom for many years, and who were full of wisdom, experience and had good heart. They knew what was best and guided the couple with a gentle hand, generously sharing all their experience. Jag känner en stor tacksamhet mot eders majestäter kungen och drottningen, för ert helhjärtade stöd, och för det sätt som ni har välkomnat mig in i er familj. Mina tankar går givetvis också till min egen familj. Till min mor och min far, och min syster och hennes döttrar. Mor och far, under hela min uppväxt har ni givit mig er villkorslösa kärlek. Ni har hjälpt mig med er klokhet, och ni har hjälpt mig att bygga en stark självkänsla och trygghet genom sunda värderingar som har väglett mig genom livet. I dag, när vi färdades genom Stockholms gator, då möttes vi av en otrolig glädje och värme. Ett minne vi kommer att bära med oss djupt inne i våra hjärtan, för alltid. Under de år som Victoria och jag har haft tillsammans har jag känt ett stort stöd från människor som jag har mött. Det har varit väldigt viktigt för mig. Jag känner en djup respekt inför de uppgifter som ligger framför mig. Det kommer utan tvekan att bli en stor utmaning. Jag ska göra mitt yttersta för att leva upp till de förväntningar som kommer att ställas på mig. Jag kommer göra mitt yttersta för att stödja min hustru, Sveriges kronprinsessa, i hennes viktiga gärning. Älskade Victoria. Jag är så stolt över det vi har tillsammans. Jag är så lyckligt att nu få vara din man. Jag ska göra allt jag någonsin kan för att du ska förbli så lycklig som du är i dag. BTW, happy summer solstice! 18h 38m 25s of daylight. Sunset at 22.09 tonight. If any single Swedish boys are mingling on Midsommer, be sure to say hi. I’m not very fond of the monarchy itself or the big hoopla that was the royal wedding. But love between two people are always beautiful, and I too was very moved by Daniel’s speech. Now that is a man in touch with his emotions! Ditto Mattias, not fond of taxpayer spending all the extras for the wedding. Alas, it was a beautiful wedding with two very loving people. And I take back the douchbag comments about Daniel. His eyeglasses are however still ugly as ever. Whomever says chivalry is dead in Sweden needs to see Daniel’s speech. They are so romantically in love, it’s amazing. He will make a great prince and eventually king for Sweden. He completely makes up for all the long slick backed hair, bright red skinny jean wearing stekares. Poor guy can he not afford contacts??? His speech was really great. he did a good job. @Andrew – I’ll forgive him for the red pants and stekare hair but damn, not those glasses! @Princess – Maybe we should start a fund to buy the Prince contact lenses? That was really very moving and their love for each other is obvious. Everyone should be so lucky. I missed his speech! Saw on “the local” that his speech is there to listen to,but also said “some of this speech is in Swedish”!?? Did he make this great speech in front of his new kingly in-laws in English? Takes balls,lol. You’re forgetting that some people,myself included,cannot abide anything near their eyes! I could never wear contacts,maybe he’s the same? Although there ARE better glasses around! For some reason he reminds me of the lead frog from Paul McCartneys “frogs chorus” song from Rupert bear or whatever it was!…Altogether now: Bom Bom Bom – aieeyieeh…Bom Bom Bom – aieeyieeh…. @Andrew – He’ll never be “king” mate.He’ll always be a lowly “prince”, as is “prince Phillip”, queen Lizzies hubby. I didn’t like him at all…until i saw how long it took him to get Victorias ring on her finger and how long she had to chase his finger around to put his on! Poor sod was shaking like a leaf! lol. I’d have collapsed well before that point due to sweat loss/dehydration and terminal wobbly leg syndrome! Kudos Prince Danny of Vastergotland! @ Dano He did make part of his speech in English and he has the most adorable accent. some bits of plastic in his eyes for a bit. Poor old V with him looking a muppet on the photos. She had a tiara on her bonce for god sake. Perhaps she could photoshop the specs out of all the pics? @Sapphire – don’t the Swedish already have tax for such things?? ADano – Madeleine did look like proper princess but the dress was hideous colour, yuck – it wasn’t blinking Disney! @Princess- Of course we have a tax for the Royal Family. We love taxes in Sweden! About 60 million SEK goes to the family per year. However, the taxpaper and StockholmsStad get to pick up the tab on security, cleanup, coordination, LoveStockholm and other expenditures amounting nearly 200 million SEK. I totally missed Madeline’s dress or wasn’t paying attention to her. Whoopsies!